Use Kidspiration to answer and create place value problems. Goal: Use a word processor to type and format sentences, using font size, font color and align text. Goal: Use a Graphics Program to draw a picture illustrating the paragraph typed in Word. 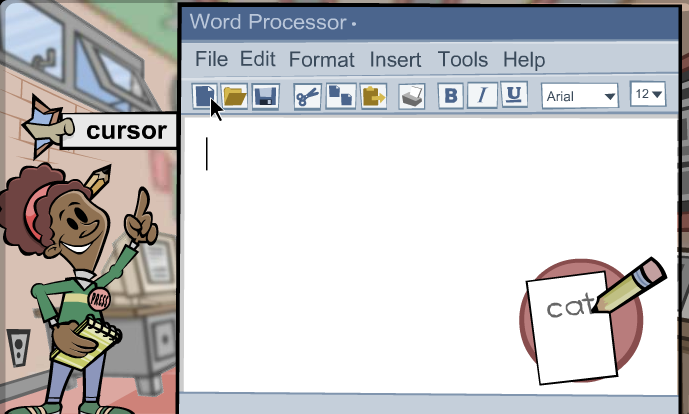 A Word Processing program is like paper and pencil on the computer. 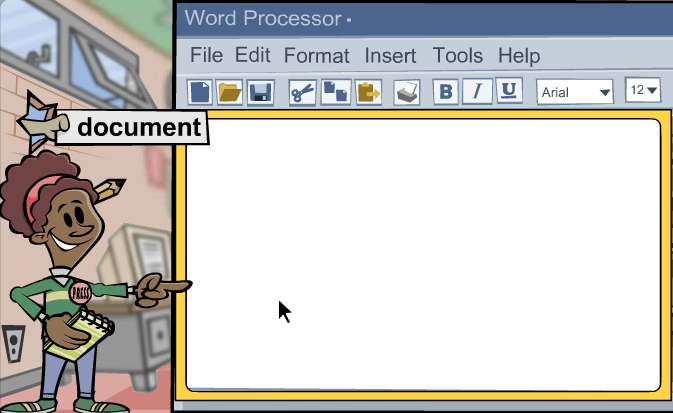 You can use a Word Processing program to type letters, numbers, sentences and stories on a computer. This is a document. It is a blank paper or page that lets you type in a Word Processing program. The flashing line is your cursor. The cursor is like a pencil - it show where your letters will show up when you type. Task 1: Listen to online information on Winter Animals to find out about animals in winter. Task 2: Type a sentence or sentences in Pixie to show what was learned. Task 3: Use drawing tools to draw a picture to illustrate the sentence(s) typed. I wrote at least one sentence about the animal in winter. I used only one space between my words. I started every sentence with a capital letter. I formatted my text - I changed the font, font color or size of my words. I inserted a sticker to illustrate my sentence. I neatly drew a picture to illustrate my sentence. I neatly colored the picture I drew. Bonus: I used features such as Cool Word, Shadow and/or Effects on my words or picture. I wrote two sentences about the American Symbol. I started my sentences with a capital letter. I changed the font, font color, size of my words. I inserted a sticker of the American Symbol. 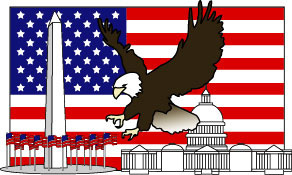 I neatly drew a picture of the American Symbol. Bonus: I used Options such as Cool Word, Shadow and/or Effects on my words or picture.